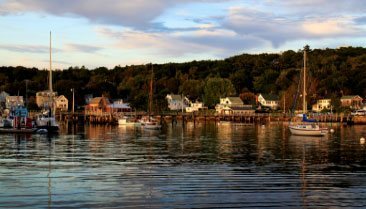 It’s no secret that Boothbay Harbor is filled with plenty of great places to eat. So many, in fact, that we simply can’t pick just one favorite. But, if there is one place that we always like to recommendation, that place is Robinson’s Wharf, Tug’s Pub and Seafood Market. Featuring a gorgeous setting and spectacular waterfront views, this seafood restaurant in is always worth a visit. Especially on a beautiful summer night! Find out more about great things to do in the Boothbay area by requesting a copy of our FREE Vacation Guide. It’s filled with recommendations for dining, attractions, shopping, and more! 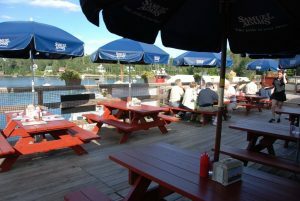 Robinson’s Wharf is a personal favorite of ours and a great place to drink local beer overlooking the water. In addition, the harborside restaurant, pub, and seafood market offer delicious and fresh lobster, shrimp, scallops and more! But, those are just two great reasons to make a visit when you visit Boothbay Harbor. Here are a few more! 1. You can reach Robinson’s Wharf by land or sea! The popular Southport eatery is located just 5-minutes from town. You can make the short drive, or if you rent a boat during your Boothbay Harbor vacation, you can pull right up to the dock just steps from the restaurant. 2. Dine-in or carry-out, it’s up to you! Whether you’re looking for a quick lunch between excursions, or you want to sit and linger by the water, you’ll have great dining options to choose from. You’ll find casual pickup options and yummy local goods at the seafood market. Or, head to the upper deck for a full-service menu and restaurant. 3. It’s a local favorite.When you visit this Robinson’s Wharf, you’ll experience dining at a local institution that has been around for over 40 years! 4. You can’t beat Tug’s Pup happy hour. For excellent drinks by the water, you have to visit Robinson’s Wharf. In the summer, there is nothing better than sitting by the working harbor with a cool drink in hand as you watch the lobstering ships go by. Oh, and the delicious cocktails and extensive beer list don’t hurt either! 5. The new Buoy Bar only makes happy hour better. Recently, Robinson’s Wharf added another great place to enjoy a drink: the Buoy Bar. Located at the end of the dock, this popular pre-dinner hangout spot offers unparalleled views of the nearby swing bridge and hard, plus plenty of relaxing sea breezes. 6. Robinson’s Wharf is open year round. Although some businesses (like ours) close during the coldest months of the year, Robinson’s Wharf does not. Open every day of the week, the seafood market opens at 7 a.m. and the restaurant opens at 11:30 a.m.
7. You can enjoy live music on the weekends. While any afternoon spent at Robinson’s is a great afternoon, make every effort to visit on the weekends. In the off-season, you can enjoy live music on Fridays from 5:30 – 8:30 p.m. During the summer, live music is offered from 1-4 p.m.
8. There are new surprises for summer 2017! If you’ve been to Robinson’s Wharf before, but it’s been a while, you need to revisit the wonderful establishment. Why? Because Robinson’s has undergone new and exciting changes recently. In addition to adding more dock space, renovating the restaurant, and improving the outdoor space, the restaurant is also unveiling a new menu. 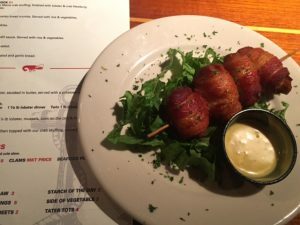 It will offer well-known favorites that have been on the menu forever, plus popular new dishes to try. 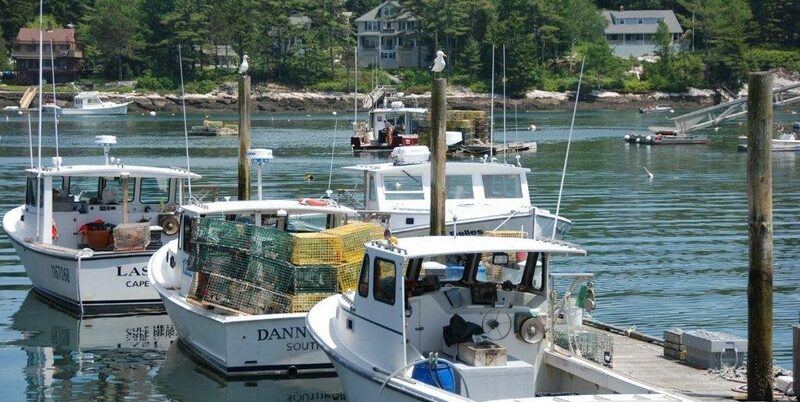 Visit Boothbay Harbor and Stay with Us! 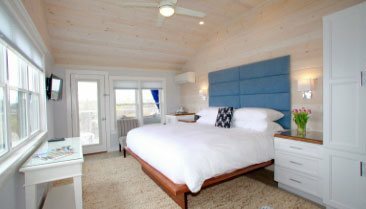 After an excellent meal at Robinson’s Wharf, return home to our coastal accommodations in the heart of Boothbay Harbor. 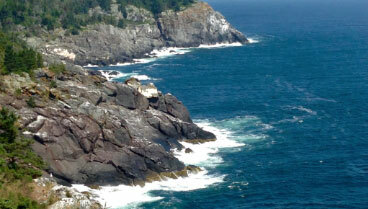 Topside Inn is located on a beautiful hilltop property just a 5-minute walk from the center of town and the shore. 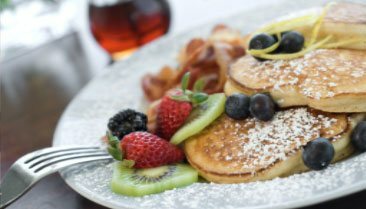 When you stay with us, you’ll start each day with a gourmet breakfast, spend the evenings watching the sunset from the comfort of rocking chairs on our porch, and rest in comfortable guestrooms filled with plenty of Maine charm. Learn more about our inn today. Then, book your next Boothbay Harbor getaway with us! We can’t wait to welcome you to the Topside Inn.